Among the numerous new boat presented at the latest shows, the 25 Fishing, built by the Italy based Fiart yard, has been surely one of the most admired. The tested unit, full optional, has been equipped with twin 150 hp Volvo Penta Turbo-charged diesel engines and sterndrives transmission. Other engine options are available and include twin or single installation with both gasoline or diesel engines. The walk-around deck allow plenty of space both at the fore deck and in the cockpit. The latest is the real boat's focal point, fitted with all is needed by the expert fisherman, such as: a strong fighting-chair with all the necessary equipment, live-wells, baits drawers, a practical working top, general purpose lockers and a small sink. Notable is the vertical sliding door leading to the aft platform which is very useful for lifting on board fishes; the swimming ladder is stored underneath it. The steering station is placed to the port side and is fitted with a comfortable double seat ensuring good visibility, which is excellent in standing straight position. The cabin access door has been placed to the outboard cabin port side, allowing for an optimal underneath space distribution. 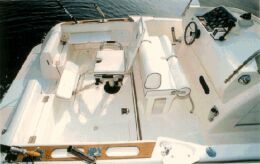 In fact below deck the 25 Fishing feature a convertible bow dinette, two beds in the aft cabin, a separated bathroom and a galley area. As usual for the yard, everything is properly dimensioned and the portholes ensure plenty of light and air. In spite of its clearly fishing-oriented concept, the boat offer a comfortable sun bathing area on the fore deck, which is easily reached tanks to the side passage ways. The perfect weather conditions did not allowed us to fully test the boat's seakeeping capabilities, but several evolution have been performed to test wave impact, and the result has been a soft hull with excellent maneuverability. Construction material and detailing: fiberglass hull and deck with longitudinal and transverse girders; wooden cockpit toe rail and detailing; side settees with locker underneath; cockpit and bow fighting chair foundations. Lockers number and place: three in the cockpit (used as live wells); several lockers are placed both on and below deck, underneath the settees and beds. Interiors: wooden access staircase; convertible U shaped sofa with telescopic table; galley area with two burners cooking top, sink and refrigerator; separated bathroom with sink, telephone styled shower, furniture, marine electric w.c., mirror, accessories, lights and shower grid; aft cabin with double bed. Steering station: to the port side and fitted with: hydraulic steering, compass, horn, engine hours counter, bilge water alarm, electrical panel, battery switch, fuel level indicator, engine monitoring gauges and instruments. Standard equipment: 12 v electric plant; batteries switch; electric panel with safety switches for all on-boars auxiliaries; pressurized water plant with tank; two bilge pumps; engine room blowers (only gasoline engines version); remote fuel valve closing control; stereo system with four loudspeakers; navigation lights; 5 fire extinguisher; methane cylinder.